The habit of reusing the same password across multiple services gives hackers opportunity to use the credentials gathered from a data breach to break into their other online accounts. So the best way to secure yourself online is to use a unique password for each site and service. However, unless you have an iron-clad memory, using different passwords across all of your accounts is going to prove difficult. In this case, you will need a reliable and affordable cross-platform password manager to keep track of all your passwords. 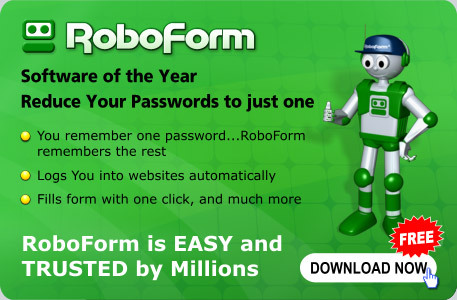 RoboForm is the world’s leading password manager that used to organize and encrypt your passwords. 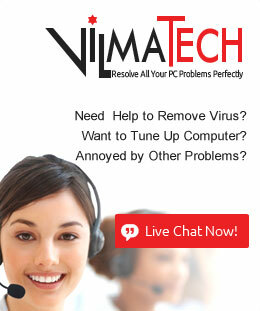 It greatly increases the convenience and security of your online experience. Check out RoboForm Review 2019 below. RoboForm is a password manager that secures your digital life and it’s free as long as you don’t mind getting by without the full suite of premium features. This password management solution supports multiple platforms including Windows, Mac, iOS, Android, and all major browsers (IE, Safari, Chrome, Edge, Opera and Firefox). It assists in generating and retrieving complex passwords, and keeping track of super long, crazy random passwords across countless accounts for you, while also protecting all your important online information—not only passwords but PINs, credit-card numbers and the three-digit CVV codes, answers to security questions, and more. RoboForm makes your digital life easier and safer than before. It enables you to easily ensure that each password is both unique and strong, and it saves you the bother of looking up, remembering, typing, or even copying and pasting your passwords when you need them. Being as a well-established and competently designed password manager, RoboForm makes you less vulnerable online by generating strong random passwords, syncing them securely across your browsers and devices, and filling them in automatically. It changes the way people live on the internet. To keep your data encrypted and secure, RoboForm uses the same AES-256-bit symmetric encryption as other password managers. Your data is decrypted only on your devices, and not on RoboForm’s servers. Your master password will never be sent to RoboForm’ servers, and never accessible by RoboForm. Besides, RoboForm has two-factor authentication (2FA) built in which adds an extra layer of protection to your account. 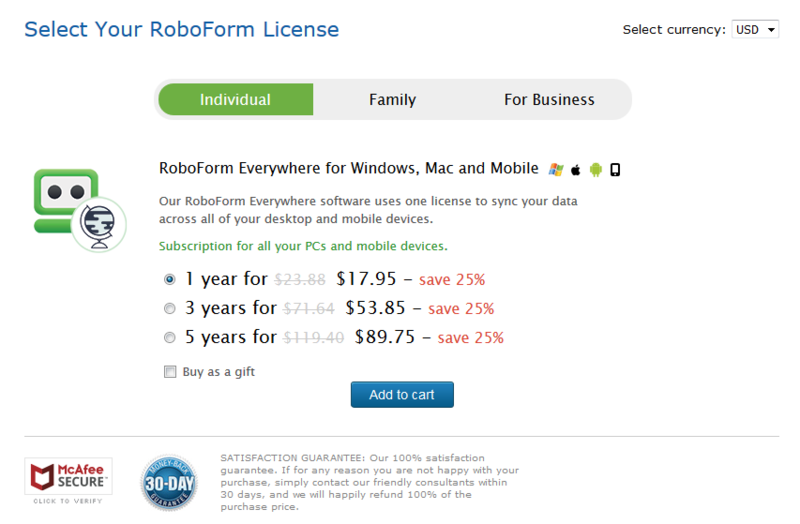 RoboForm offers both free and paid version. Both of them let you save unlimited passwords, autofill web forms, audit passwords, send passwords securely and receive emergency access to another RoboForm user’s account. Roboform puts security first before anything else, with AES-256 encryption, local data storage to prevent any data leaks, and two-factor authentication. If you are looking for a basic and good password manager for no cost, RoboForm is a solid option for you that covers everything you need to manage your password. Get started with RoboForm now! The most basic version of RoboForm is free. In this plan, you will be able to use RoboForm to store an unlimited number of logins and create secure identities containing specific personal information just with a few clicks. You can also replace weak passwords with stronger, randomly generated ones, helping to increase your score. RoboForm also helps store and organize links to your favorite websites as Bookmarks. Get Unlimited Logins, Fill web forms, Multi-platform support, Strong encryption, Password audit, Securely send Logins, Receive Emergency Access, Application Logins and Manage Bookmarks from the basic RoboForm Plan for free now! The premium version of RoboForm is called RoboForm Everywhere. Compared with the basic RoboForm Plan, this version allows you to automatically sync information across multiple devices using RoboForm’s secure cloud. It also gives you the option to add an emergency contact, someone who will have access to your RoboForm account in the event of an emergency. You also have to upgrade to RoboForm Everywhere in order to create shared folders. 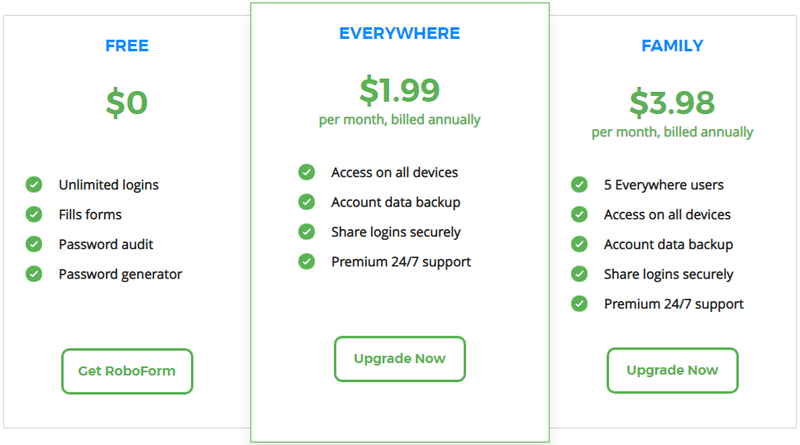 RoboForm Everywhere Price starts from $23.88/year and you can choose 3 different plans – 1 Year Plan, 3 Years Plan and 5 Years Plan. The subscriptions can be used for all your PCs and mobile devices. RoboForm Family allows families of up to 5 users to share logins, identities, as well as safe notes. Plans starts with $47.75 for a year. But you can get a discount with a three-year or five-year plan respectively. A central administrator can decide which users have access to what information, while individual users can also create their own, private entries. The family version also comes with automatic syncing and account data backup. 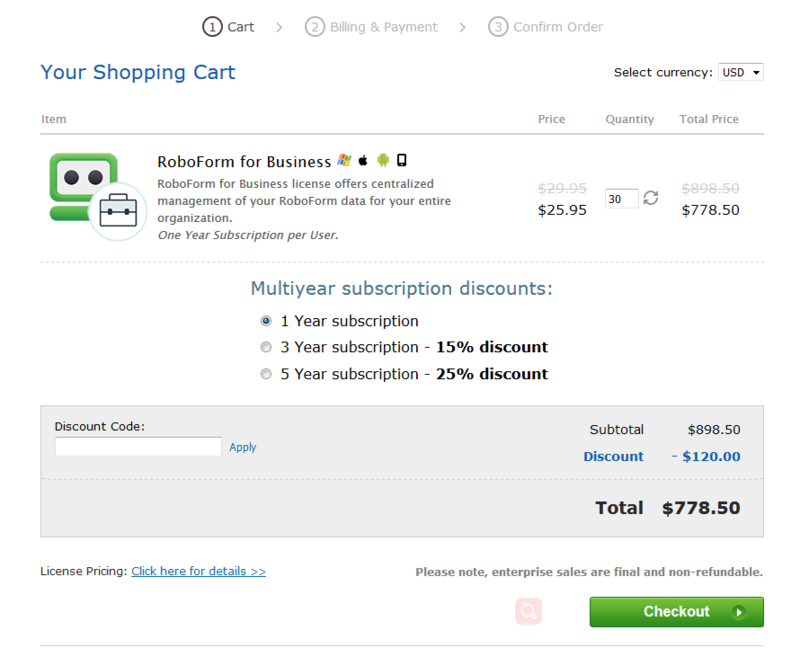 RoboForm for Business is available for only $29.95 a year per user. It allows companies to securely share passwords and other sensitive information among multiple employees. This version offers a centralized Management Console, which allows administrators to designate permissions, assign credentials, view password security reports, and streamline the onboarding process for new employees. And RoboForm Business offers two-step verification, adding an extra layer of security. Easily remembered passwords are also easily cracked so most of us use very weak passwords and reuse them on different websites. But it makes you vulnerable on multiple sites if one of your passwords is compromised. Password leak is a serious problem each year, even on large websites. leak at one website could give people access to all your accounts. You’ve probably heard about the infamous yahoo breach that came to light in 2016, in which hackers stole the credentials and other sensitive information of more than 1 billion users. For people who used their Yahoo password for other sites, those accounts were also compromised. So, creating a strong and unique password for each account is the only way to avoid this problem. A strong password consists of at least six characters (and the more characters, the stronger the password) that are a combination of letters, numbers and symbols if allowed. But how come you remember all complicated passwords on different websites? Storing passwords in a document or writing them down? It’s not a wise decision because it creates a very high risk of being affected by a breach or simply losing the information. Here you will need a password manager. Using a password manager, then you don’t need to remember the unique, long, complex password for every online account anymore. Password managers can help users quickly create unique logins for each of their individual accounts. Users can adjust password requirements or force users to generate new passwords every few months. In addition to improving security, Password managers make life easier for users and expedite the login process across applications. RoboForm is one of the best password managers that only eliminates the need to remember multiple passwords, but also ensures that your passwords are stored safely with using the top-level encryption. Get RoboForm Free to protect and manage all your logins and passwords, credit cards, identities, bank accounts, passports and more! Support All Browsers – RoboForm is available for Chrome, Firefox, Safari, Microsoft Edge, and Opera. One Click Logins – Leave the hassle of typing usernames and passwords behind. RoboForm logs you in to websites with a single click. Auto-Fill – Use on page AutoFill or select a Login directly from RoboForm. You don’t need to search for your password anymore because it will be automatically provided for you when you log in via your computer or mobile devices. Sync Password – The RoboForm Everywhere secure cloud keeps your passwords backed up and in sync across all your browsers and devices. Offline Access – RoboForm Desktop and mobile apps provide offline access to RoboForm data. In addition, the desktop version offers optional local-only storage (option not available in Business version). 256-Bit Encryption – To protect your data, RoboForm uses AES-256 bit encryption with PBKDF2 SHA-256. This is the same data encryption used by military and government organizations. Import and Export Feature – You can Export all credentials to any other password managers. You are also allowed to import all details from other password managers. Two-Factor Authentication – Two Factor Authenticaton (2FA) is available for RoboForm Everywhere accounts. 2FA options include Google Authenticator, Authy, Microsoft Authenticator and other time-based one-time password (TOTP) authenticator apps. It adds an extra layer of security for you. Share Single Items or a Folder – Want to provide someone with access to a password or folder with confidential information? Share them securely in RoboForm without the risk of exposing sensitive data in the process. Emergency Access – Emergency Access allows you to select a trusted contact to securely obtain access to your RoboForm Data in the event of death, incapacitation, or simply as a method of account recovery. This feature gives a company the ability to recover a user’s personal data(data that isn’t shared through a group) if they lose their Master Password or are unable to access RoboForm. Family Plan – RoboForm Family Plan provides peace of mind knowing your loved ones are not only saving precious time, but also staying secure online. Bookmarks – RoboForm is the only major password manager that organizes your bookmarks for quick and easy access across all of your browsers and devices. RoboFrom has been around since 1999 and it has always had a large number of dedicated, die-hard users who’ve rallied around it. As one of the most popular and well-known password managers out there, it supports Windows, macOS, Linux, Android, and iOS, with plugins available for Chrome, Firefox, Safari, Microsoft Edge, and Opera. RoboFrom is like a “vault” with all of your passwords and logins for every site and app you visit. It’s locked with a single key — the only one you need — and when you open that vault, you see all of the passwords and log-ins for all of your accounts. RoboFrom simplifies your digital life and it has all the required features of storing your credentials and other sensitive data and letting you access them through standalone applications or browser extensions. It helps you change your passwords easily when needed and offers granular controls for things like autofilling so users can choose how they want the manager to behave. RoboForm also has bookmarking features to help you keep track of your favorite sites. Users can access most of its features for free. The free version supports unlimited logins on a single device, so you can give it a whirl on your dekstop or smartphone if you’re curious. If you need more or need to sync or access passwords on multiple devices, you’ll need RoboForm Everywhere, which will set you back around $20/year for all of your devices and computers. 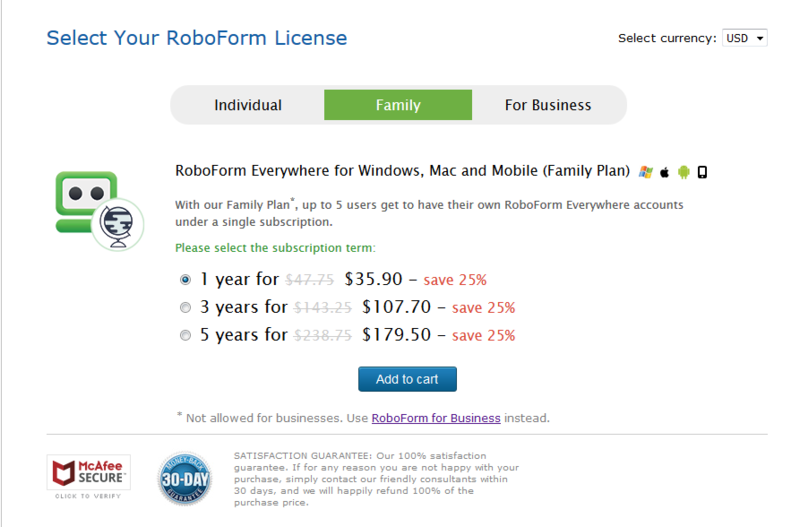 You can also snag a family account, giving five people access to Roboform Everywhere while paying $47.75/year. If you are running a company, RoboFrom also has a Business Plan for you. Overall, RoboFrom is a complete solution for protecting your personal data by securing and strengthening personal passwords. With it, you will never need to remember or type your passwords again. Sign up for Free Now!